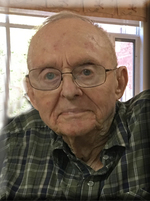 Arnold passed away suddenly at the Great War Memorial Hospital, Perth on Saturday, April 13th, 2019 in his 92nd year. He is survived by his loving wife Lorraine. Arnold was the father to Gary (Anne), Greg (Pat), Heather, Stephen (Shellee), Candice Larmon, Jack (Marilyn) Clark, Janice (Dave) Dunnigan and the late Jim (Marion) Clark. He was predeceased by his infant daughter Pamela, his parents Herbert and Sadie (Kirkham) Fournier, brothers Reginald and Gerald, and grandson Travis Clark. Arnold is survived by his brothers Ronald and Glenn, many nieces and nephews. He was Grandpa to Krista, Devin, Dillon, Jackson, Hanna, Christopher, Lindsay Marie, Chris and Brandon, Lindsay Sarah, Brittany, Clark, Todd, Stacey, Ryan, Paula, Greg, Dayna, and Kaley. He leaves behind 24 great grandchildren plus 2 more on the way. Arnold was an avid golfer, curler, horseshoe player and musician. He also volunteered at numerous clubs and organizations in the Perth and Maberly areas. Music was his passion and he played and sang most of his adult life. While still working at his day jobs, he operated the Perth Dairy Queen. He retired in 1989 as office manager at the Perth Jail. Friends may pay their respects at the Blair & Son Funeral Home, 15 Gore St. West, Perth on Thursday April 18th, 2019 from 10:00 to 11:30 A.M. Funeral service will be held in the Chapel at 12:00 Noon. A reception will follow in the Royal Canadian Legion Branch 244, Perth. The family would like to thank the staff at Lanark Lodge for all their kindness and caring for Arnold over the past five years. In remembrance of Arnold, contributions to the Maberly Agricultural Society or the Laidley Cemetery would be appreciated.